Model No. 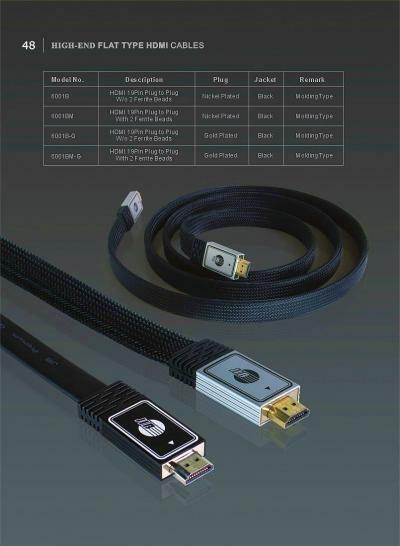 6001B/BK Type A to Type A HDMI v1.4 cable is a pioneer in digital transmitting cable family. Combining video and audio into a single digital interface, HDMI is building on the features and benefits of DVI, adding new capabilities, maintaining full backward compatibility with DVI will transmit frequency up to 5GHZ bps, It can carry high quality multi-channel audio data and can carry all standard and high-definition consumer electronics video formats. It can also carry control and status information in both directions. With a compact interface, HDMI can transmit higher quality digital video signals (10/12bits) and supports digital audio frequency including DVD-Audio, etc. HDMI is widely used for transmitting signals form set-Top Boxes. HDTV and other audio visual sources to television sets, projectors and. other video displays Durablc Gold-Plated Internal Shield Corrosion-Resistant 24K Gold Contacts. Heavy-Duty Internal Dual Strain Relief High-Density Triple-Layer Shielding for Maximum Noise Rejection Nitrogen (Nz) Gas-Injected Dielectric for Maximum Signal Strength 1.4 certificate version and support 1080P RoHs Compliant. HDMI Cable with black PVC jacket + Nylon Sleeve in a Nice Gift-Box Package.